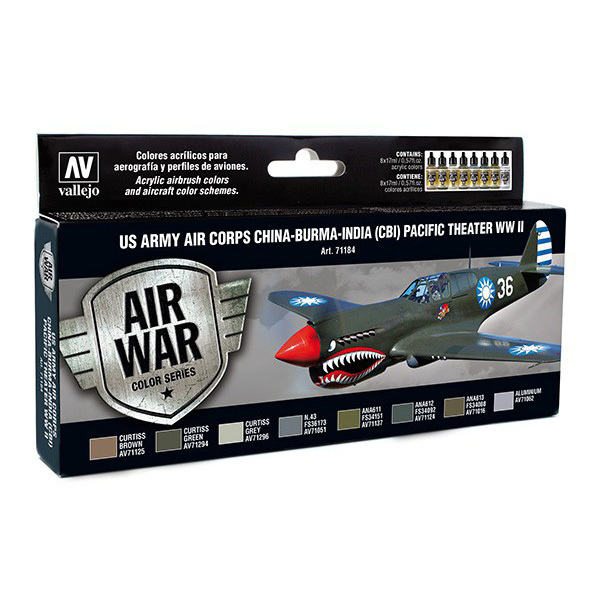 Water-based Acrylicos Vallejo Model Air paint is formulated especially for airbrushing straight from the bottle . . . no thinning or special mixing is required. Made with finely-ground pigments and airbrush-perfect viscosity, Model Air goes on smoothly and covers well, even with just a thin coat. Tiny surface details won't be obliterated, and the resulting matte finish is durable and waterproof. Model Air acrylic paints are non-toxic and odor-free, and clean-up easily with water. Acrylicos Vallejo Paint Sets include 17 ml (approx. one half-ounce) squeeze bottles with dropper-style tips for easy dispensing. US Army Air Corps China-Burma-India Theater (CBI) WWII Paint Set includes 8 Model Air colors developed for painting the principal camouflage patterns of most of the US Army Air Corps aircraft deployed in the CBI during WWII: USAF Brown, US Forest Green, USAAF Light Gray, Neutral Gray, US Light Green, USAF Green, USAF Olive Drab and Aluminum.